A new resource for fursuit commissioners has been shared on Reddit's r/furry subreddit: a Google spreadsheet of makers maintained by open collaboration, to the surprise of the original sharer (who created it for personal use). The r/furry moderators have been asked to add it as a key resource on their sidebar. … [it's] a bit of a long story (so I'm told). But basically involved a fursuit maker getting less than good marks and complaining to the admins, who promptly removed the "offending" account. They're trying to rebuild themselves on Tumblr. Their new Tumblr account and a new, separate Fur Affinity account seem to be starting over from scratch, after losing much important data. It calls attention to the challenges they face. A list is a great resource, but a list isn't a system. Let's consider organizing a better system. Why is sharing reviews important? Finding a fursuit maker can be a time-consuming, random process. A hopeful commissioner may spend days combing through forums, examining galleries, and asking other fursuiters about their experiences. When a maker is found, it takes a lot of trust; you might wait over a year after paying a deposit, before seeing the result. That's if you can get in their queue! Few businesses work that way. The way that furry fans enthusiastically queue up and navigate this process says a lot about the power of DIY fandom. Of course, fandom is personal, and fursuits are often made with love. It may be tough to organize formal relationships between makers and commissioners. But with the relatively high amounts of money changing hands in this growing cottage industry comes a need for accessible, independent assistance. In time, perhaps fan-maintained resources can contribute to even better systems. Until then, commissioning will remain complicated by questions of trust, and a fragile word-of-mouth network that doesn't always connect the pieces. Afterthought: offering (or partnering with) escrow service could be one idea to make an independent commission facilitation service be self sustaining. Platforms take small service cuts for that. I have no idea when costs start to make sense, but the next question is what scale would it need to start. Yeah, this is small scale, but commissions worth thousands are a big deal to the parties involved. Or they have to take a hit on the materials in advance and make the suit, and now the balance of power shifts to the buyer. What if they ordered a really distinctive character - one you couldn't easily modify into a generic fursuit - then cold feet and walked out on the deal? Neonbunny told me: we need "yelp for furries". Whelp? I just made many updates to the fursuit maker spreadsheet and will let others know it exists. Thanks!! I have not heard from the r/furry mods about posting it in the sidebar, but I hope it will get shared more. Edit: yay, they put it on the sidebar. I realize this is a super old article, but there's two new resources about now. http://makersdatabase.tumblr.com is a database for fursuit makers that is organized a little better than the spreadsheet listed. Only con is it's on tumblr. 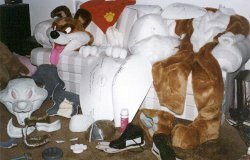 http://fursuitreview.khat.us (also on FA: http://furaffinity.net/user/fursuitreview ) is like fursuitcritique but currently is updated a lot more. It was created in August 2015, after a particularly long inactive streak on fursuitcritique. Full disclosure, I created FursuitReview. In addition, the fursuitmakerreviews tumblr was deleted a while back.